Grey Gardens explores a very special level of hell: family. Imagine being trapped at home forever, trapped in a decaying house with your decaying relatives and spiralling down down down into insanity, isolation and filthiness. What sets Grey Gardens apart is that its family are veritable A-listers of 20th century American aristocracy: the Bouviers (Jackie Kennedy being the most notable alumni). In 1975, Albert and David Maysles released their direct-cinema documentary Grey Gardens, exploring the domestic lives of two upper-class recluses, a mother and daughter both named Edith Beale. The film explores the relationship between the women, living in squalor in athe titlular creaky, damp and dilapidated mansion. This place once hosted the creme de la creme of the East Coast social set, so audiences were shocked at the depths to which the former "girl who had everything" had sunk. By 2006 the film had picked up a sizeable following in the gay community, leaving audiences spellbound by the forthright personalities, faded glamour and high camp. And so, it was adapted into a musical by Doug Wright, Scott Frankel and Michael Korie, to much acclaim. Now it finds it's way to London. Translating a 'direct cinema' documentary into a musical is a steep challenge. The show tackles it by presenting a chronologically bisected narrative, the first act showing us the early 40s social pinnacle, with the second half digging deep into the 70s squalor. Herein lies the core problem with Grey Gardens: the second half is ridiculously better than the first. I get what they're going for: ladling on pathos by showing us just how far these women have fallen and having them almost literally haunted by the ghosts of their glorious past. Theoretically this should work gangbusters, allowing us to tease out the origins of their mania and isolation. In practice what you get is a lethargic, tension-free hour of musical theatre. We know exactly where this train is going and I was increasingly impatient to get there. Matters weren't exactly helped by the deeply tiresome queen-y caricature of George Gould Strong (Jeremy Legat). He's the older Edith's piano accompaniment and man-pet, but is apparently designed to deliver a steady stream of dusty innuendoes that lazily stand in for actual humour. Once we've got this achingly slow set-up out of the way, things pick up. Post-interval is the meat of the night, fuelled by the excellent double-act of Sheila Hancock and Jenna Russell. The duo fizz together, all bitchy insecurity and flights of delusional grandeur leavened with sadness and loss. Russell in particular is downright hilarious as Little Edie, behaving as if she's performing to an invisible audience, which of course, she is. Russell stalks the stage with weirdly compelling confidence, making outfits that look like she's drunkenly stumbled through Oxfam work. In these scenes you see the reason for the material's devout cult following; it's easy to feel the magnetic outsider-tug as she deems her bizarre clothes "my revolutionary costume" and angrily kicks against her snobby Hampton neighbours. Shoring up things are a marvellous set courtesy of Tom Rogers, you can practically smell the black mould on the walls. Haphazard piles of trash dot the stage; the aristocratic debris of tattered furniture, ruined chandeliers and a lifetime's worth of chintzy gee-gaws. Jonathan Lipman's costuming is also worthy of attention, again primarily in the latter half. Everything is frayed and ripped, the characters engaged in a futile scrabble to keep up appearances in the face of domestic entropy. 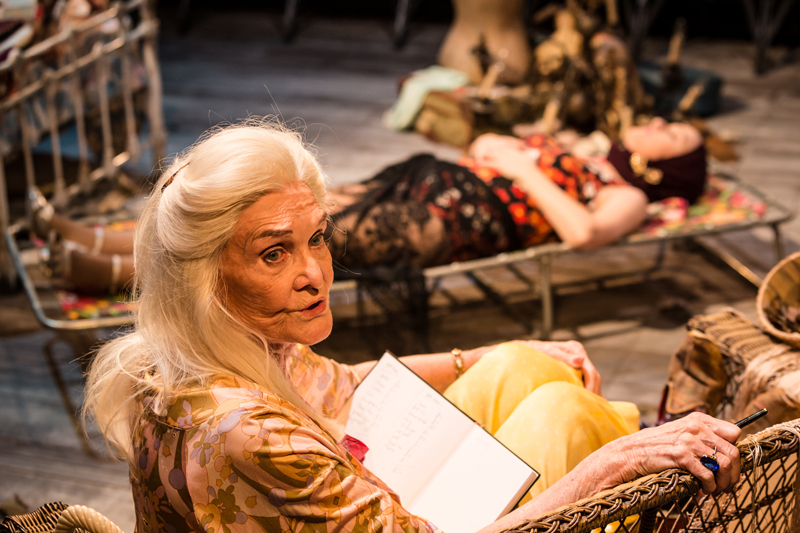 As the curtain falls, Grey Gardens stands out as a remarkably distinctive 'downer' musical. This is a story that can only end miserably, and in the final moments are a kaleidoscope of misery, suffocation and loneliness. As someone who occasionally has to suppress his gag reflex at super-syrupy musical happy endings, I appreciate these dollops of darkness. I'd like to recommend Grey Gardens more than I can. The two Ediths are absolutely fascinating characters and this show portrays them beautifully. That, in combination with top-notch staging, performances and nice songs should make this a no-brainer. But then there's that desperately dull first half. In all honesty, my advice is to skip the first half and hang out in the bar until after the interval. You won't miss much. 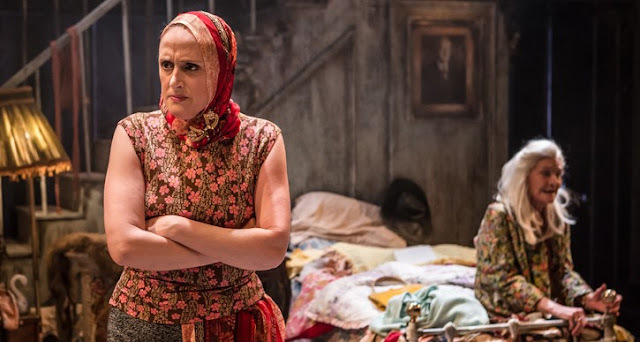 Grey Gardens is at the Southwark Playhouse until February 6th. Tickets here.